Our company is engaged in offering a rage of equipments like Mox regulator which are used for regulating the flow of the fluid inside the pipes. These devices are fitted with pressure gauge and safety valves for ample secure features and high speed accuracy. Our products meet the specific requirement of the clients. MOX-Regulator with Yoke for A Type Cylinder. Multicare Surgical Products Corporation is manufacturer of Mox Regulator. These regulators have bright chrome plated forged brass body that ensures long life and corrosion resistance of these products. 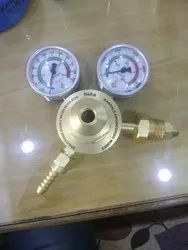 Pheumatic Connection: 1/8" 1/4" 3/8"
We supply all types of gas regulators, oxygen, Nitrogen, Air with best quality and most reasonable price.